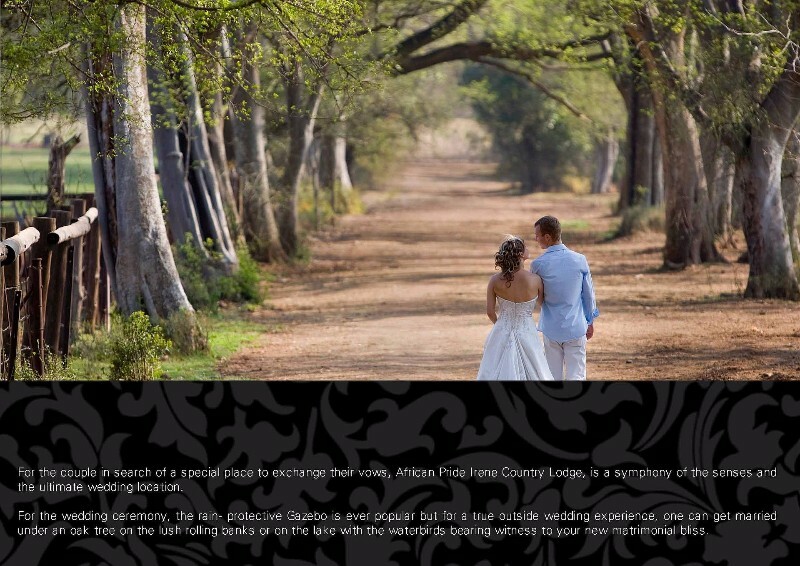 African Pride Irene Country Lodge is located in the heart of the historic Irene village. 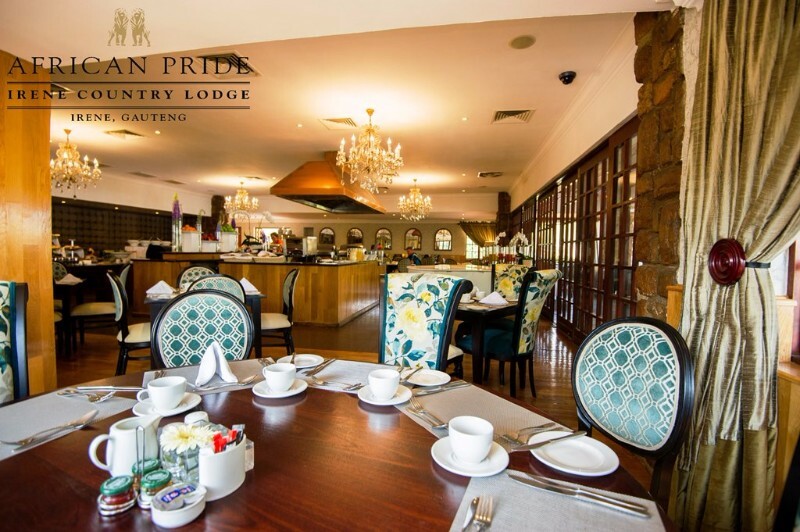 Luxury accommodation in the heart of Gauteng, South Africa’s Economic Capital, the historical village of Irene, Centurion is known for the long and winding oak-lined country lane where cows graze in green pastures, you will arrive at a haven of peace and tranquillity, and you will definitely not think that this hotel is in Centurion, Pretoria or Gauteng for that matter! 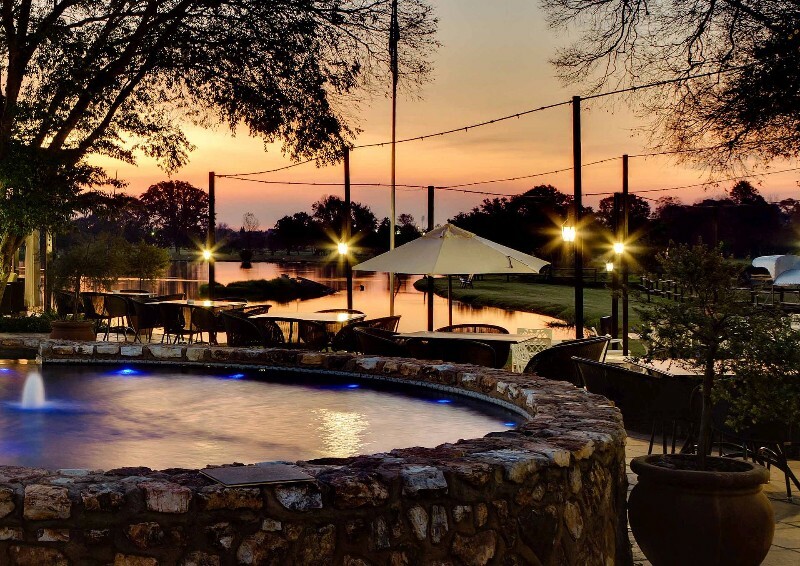 With lakeside views to rival most paintings, African Pride Irene Country Lodge is a luxury upmarket hotel, this hotel boasts 75 spacious luxury accommodation rooms, a fine dining restaurant, conference, function and wedding venues, and also boasts a luxurious upmarket day spa calledCamdeboo Day Spa. 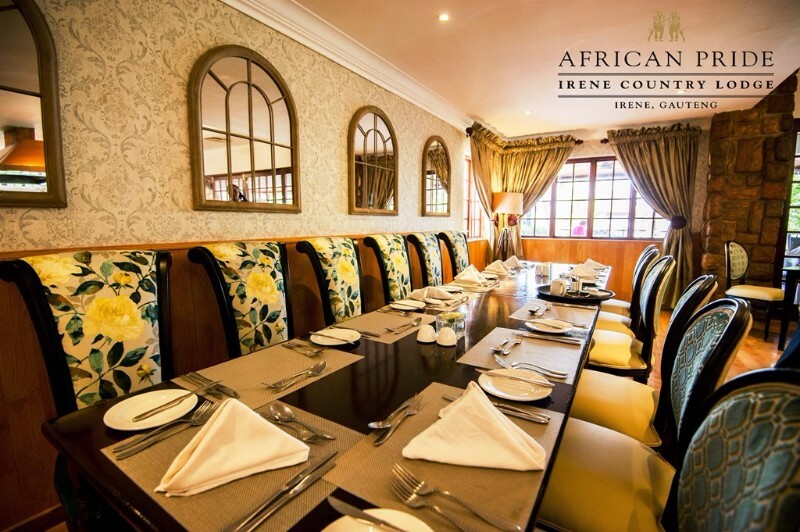 African Pride Irene Country Lodge is centrally situated between Johannesburg and Pretoria and just 20 minutes from the Johannesburg International Airport. 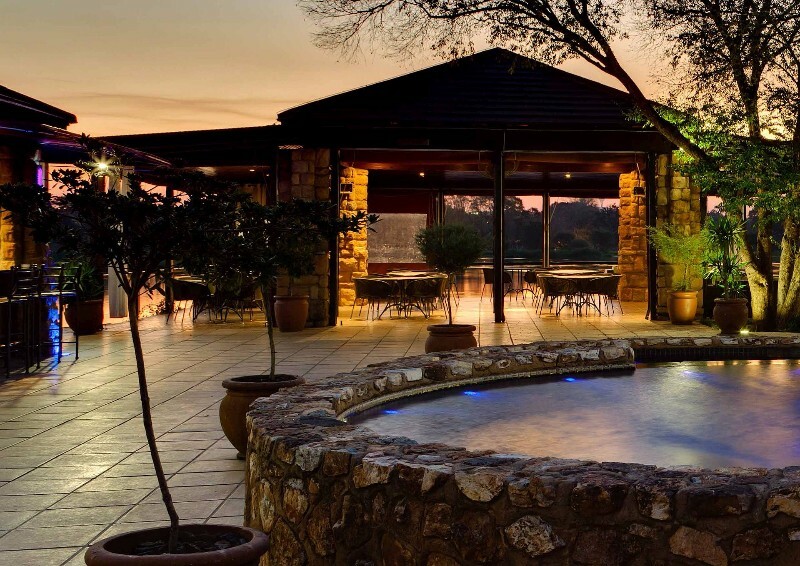 A haven of peace and tranquility in the hub of South Africa’s economic heartland, Irene Country Lodge offers luxury accommodation. 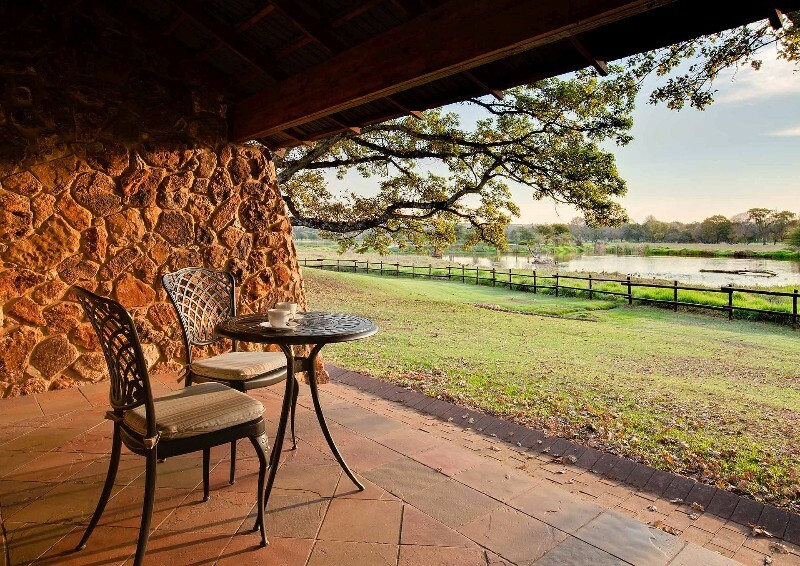 Each room opens onto a private patio/balcony and overlooks a beautiful lake and the lush green meadows of an adjoining farm. 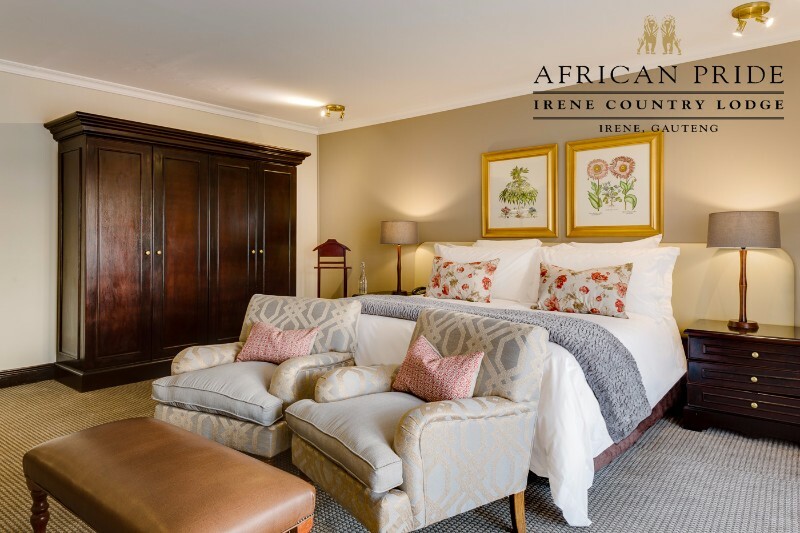 From the sweeping, romantic oak tree lined lanes and the stone façade, to the roaring fireplaces and luxurious finishes, Irene Country Lodge is an inviting and convenient setting, befitting of any occasion. There is simply no better place to captivate your guests. Depending on the time and area you would like to host the event the following is suggested. If you would like to enjoy our breakfast buffet which includes coffees, teas, desserts, and juice, we could set your table on the terrace. The terrace is a semi-private area in Meadow Green Restaurant which overlooks our beautiful lake. The Meadow Green Restaurant breakfast buffet is served from 6:30 – 10:00. A welcome drinks/gift table can be set up if so preferred. 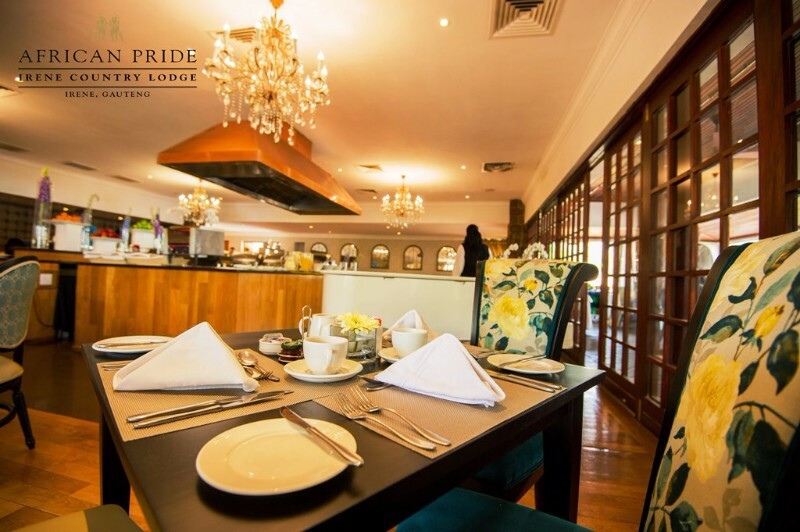 There is a surcharge of R100.00 if bringing in a cake, cupcakes etc… However, our buffet offers a selection of desserts and sweet delicacies, which is included in the buffet cost. Table decorations like “thank you” gifts and flowers are permitted in this area. Evening Under the Stars is offered every Saturday evening in Meadow Green Restaurant. This is a delectable seafood buffet which is enjoyed to the background music of Nora Jones performed by our pianist. There are alternative dishes for guests who do not prefer seafood. You can bring in your own flowers for the table as décor. 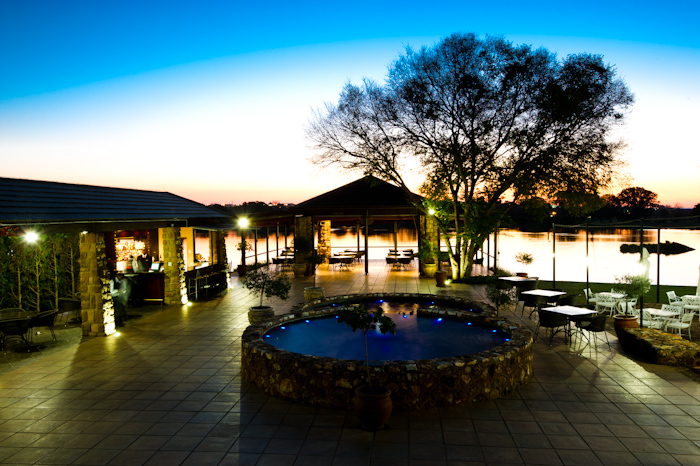 The Lakeside Open Area is ideal for your type of event. The tables can be set at the open area next to our beautiful lake. Mezze platters (as per your selection) will be served from the wagon. 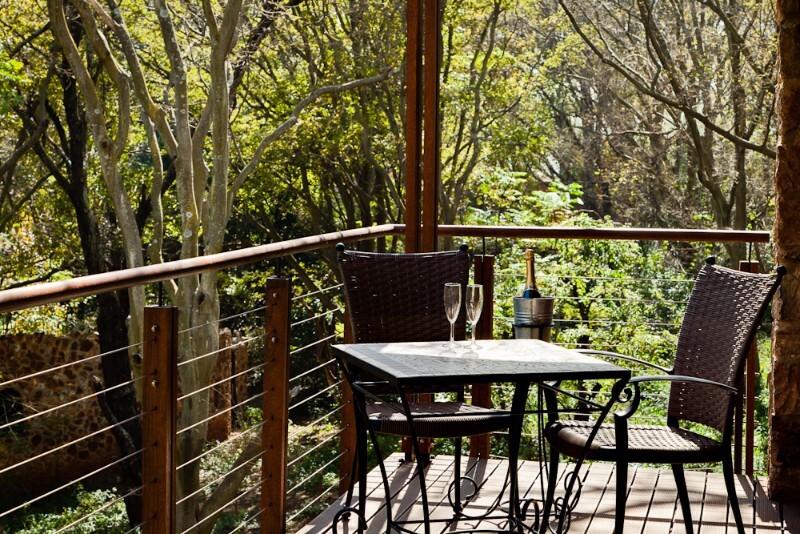 We have a Lakeside bar from which your guests are welcome to order their drinks. A gift/welcome drink’s table with either jug of juice or drinks of your choice can be set. Table decorations like “thank you” gifts and flowers are permitted in this area. I have attached the Mezze Platter menu for your perusal. Pre-selection is required. There will be staff and waiters to assist with orders from the bar. A coffee and tea station will cost R55 per person. At a cost, dependant on the size of your group we offer private venues, which are ideal for all group sizes. A variety of Mezze Platters, Cocktail Menu or Plated Menu can be served. At the private venues any games, visual equipment, decorations etc… are permitted. Private venue costs only include staffing, set up, cutlery, and linen (White chair covers & white table cloths). You are welcome to bring decorations relating to your event. We have a lovely SPA on the premises. If your guest’s book for treatments in the SPA, we could serve Mezze Platters, drinks etc…… and you can enjoy all the SPA facilities for the duration of the treatments. The SPA has a lovely restaurant where the tables will be set according to the size of your group. We have a variety of different private venues, varying in size from small intimate venues to our larger Nomadic which is ideal for big groups. We also offer a variety of Mezze Platters, Cocktail Menu, Plated Menu or Buffet Menus that can be served. The private venue includes staffing, set up, cutlery, and linen (White chair covers & white table cloths). You are welcome to bring decorations relating to your event or we would gladly get you quotes from our preferred suppliers. 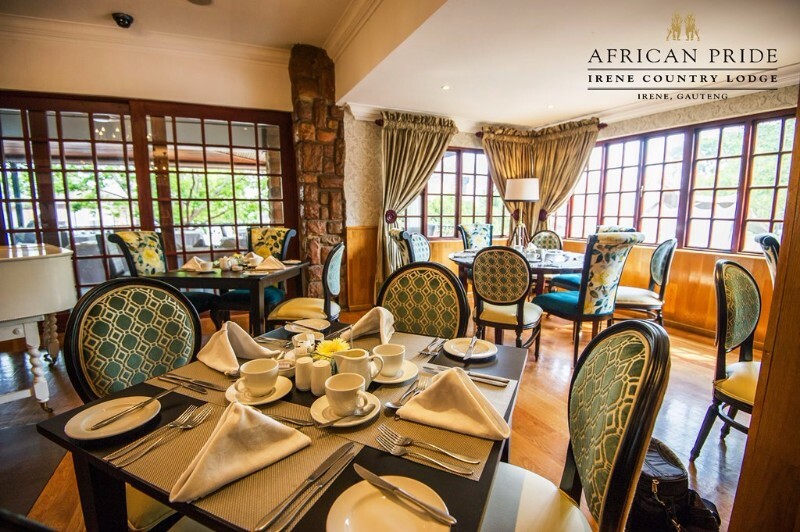 We would love to host you for an inspection of our beautiful property to show you our diverse dining options. 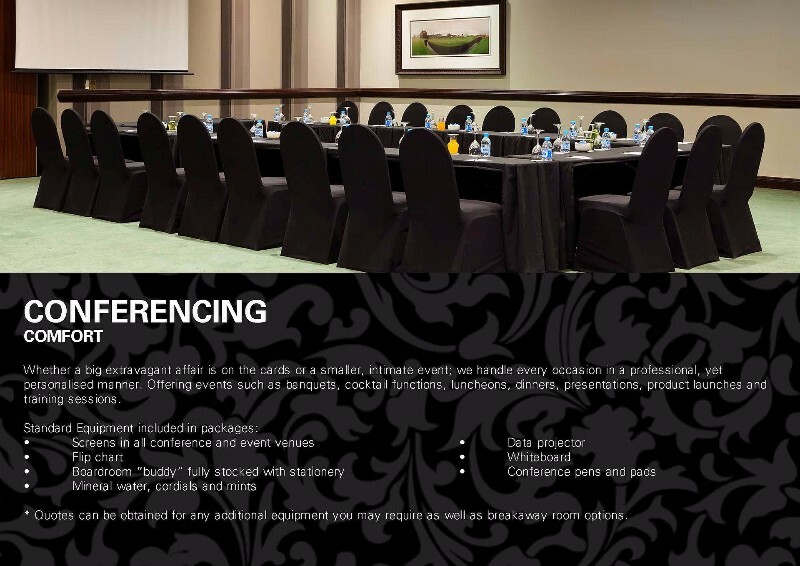 Depending on the time and area you would like to host your event the following is suggested. 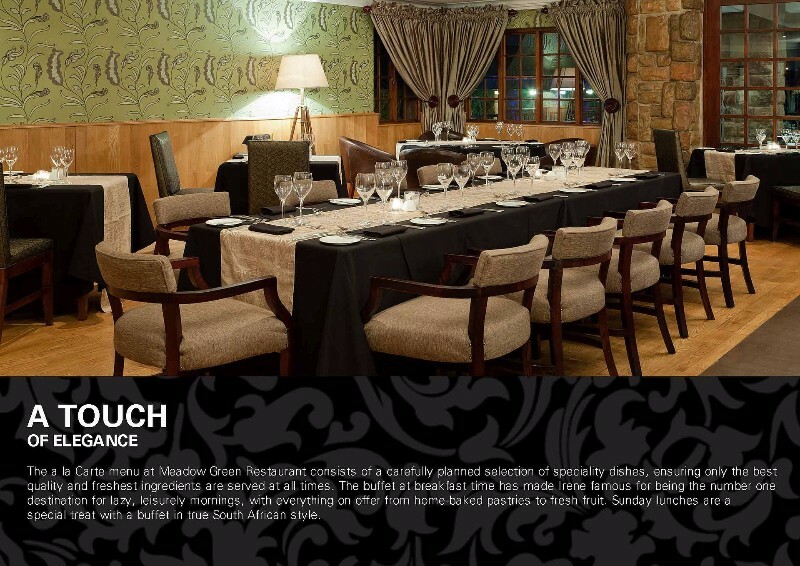 Monday to Sunday from 13h00 – 15h00 (Lunch) and 19h00 – 22h30 (Dinner) Served in the Meadow Green restaurant. 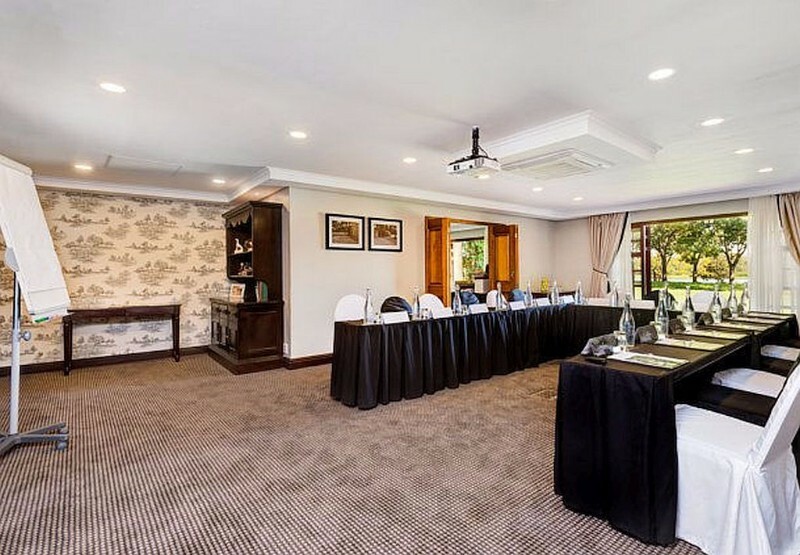 We have a variety of different private venues, varying in size from small intimate venues to our larger Nomadic which is ideal for big groups, click here to see online photos of these venues. We also offer a variety of Mezze Platters, Cocktail Menu, Plated Menu or Buffet Menus that can be served. 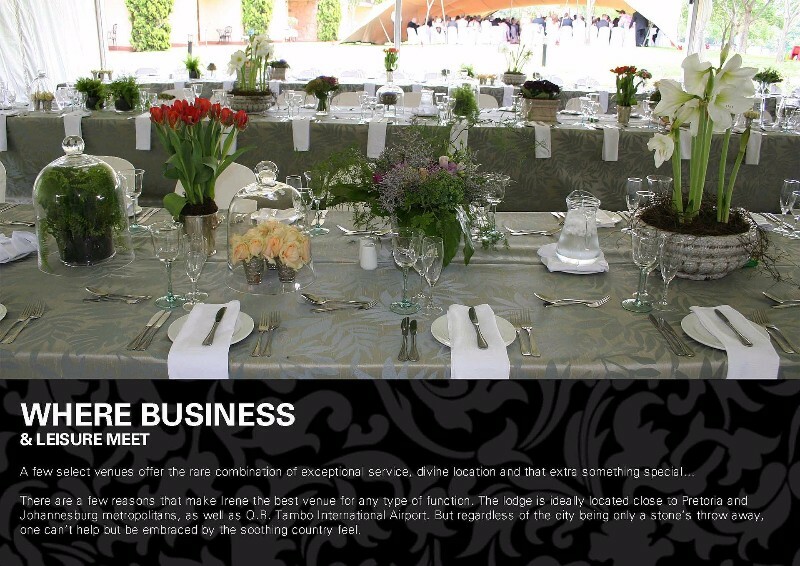 The private venue includes staffing, set up, cutlery, and linen (White chair covers & white table cloths). You are welcome to bring decorations relating to your event or we would gladly get you quotes from our preferred suppliers. 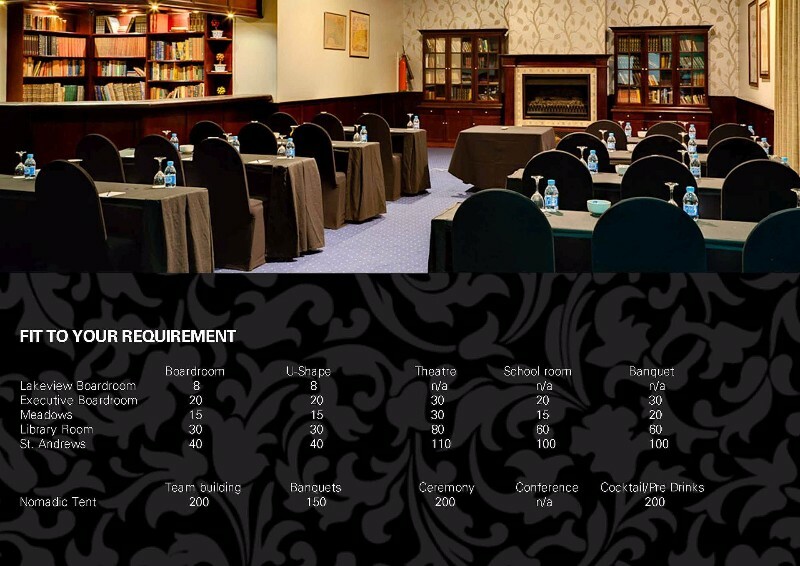 * Quotes can be obtained for any additional equipment you may require as well as breakaway room options. 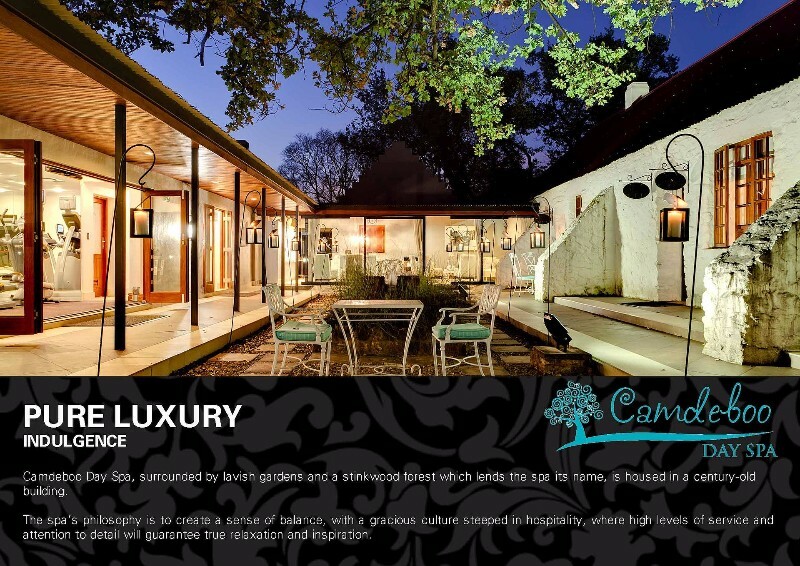 Includes: welcome drink, superior room accommodation, selected spa treatments at Camdeboo day spa, 5 course dinner, breakfast buffet, picnic basket for picnic, complimentary internet & parking, complimentary Aqua Day Spa facilities. During weekends also have an alternative for dinner with an Evening under the stars seafood extravaganza buffet accompanied by enchanting piano tunes of well-known pianist Norah Jones. Inclusive of: complimentary arrival drinks, complimentary internet up to 500Mb, free parking, complimentary Aqua Day Spa facilities for over 16 year olds, breakfast, kids entertainment, selected treatments at Camdeboo Day Spa, (for over 16 years enjoy sensation showers, sauna, steam room, jet pool, techno gym), lunch option choice of either at Irene Market or Irene Dairy farm, watch the Irene Dairy cows being milked from the special viewing gallery. Accommodation for children complimentary in inter-leading room. 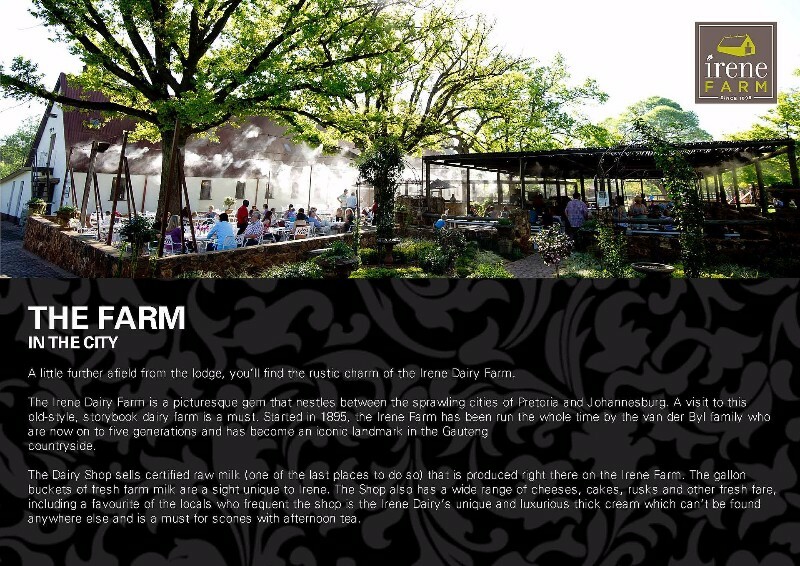 Inclusive of: complimentary arrival drinks, complimentary internet up to 500Mb, free parking, complimentary Aqua Day Spa facilities for over 16 year olds, breakfast, lunch option choice at either Irene Market or Irene Dairy farm, watch the Irene Dairy cows being milked from the special viewing gallery, 10% discount at the Camdeboo Day Spa. 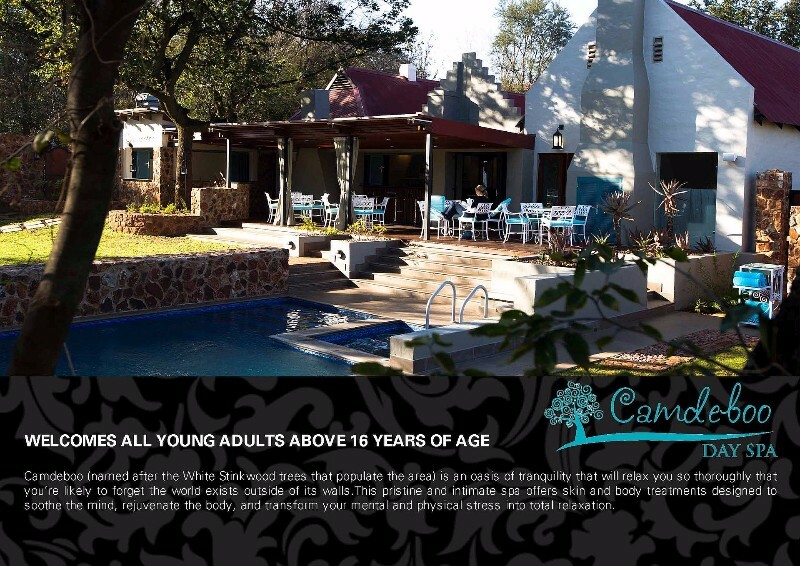 • Camdeboo Day Spa with Sensation Showers, Sauna, Steam Room, Heated Jacuzzi, Techno Gym, Swimming Pool and Sun Lounger area. 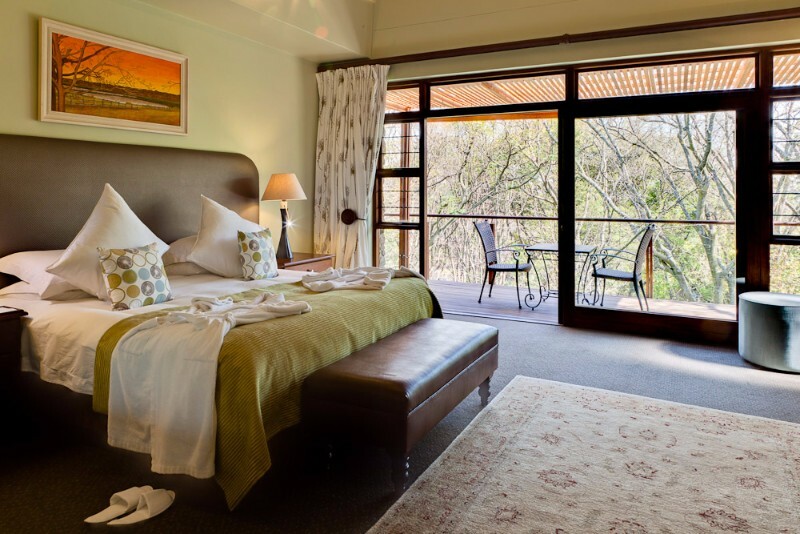 The LUXURY KING/DOUBLE ROOMS are situated at the start of our amazing natural Camdeboo Forest, each room opening onto a patio with a stunning view of the lush, green meadow. 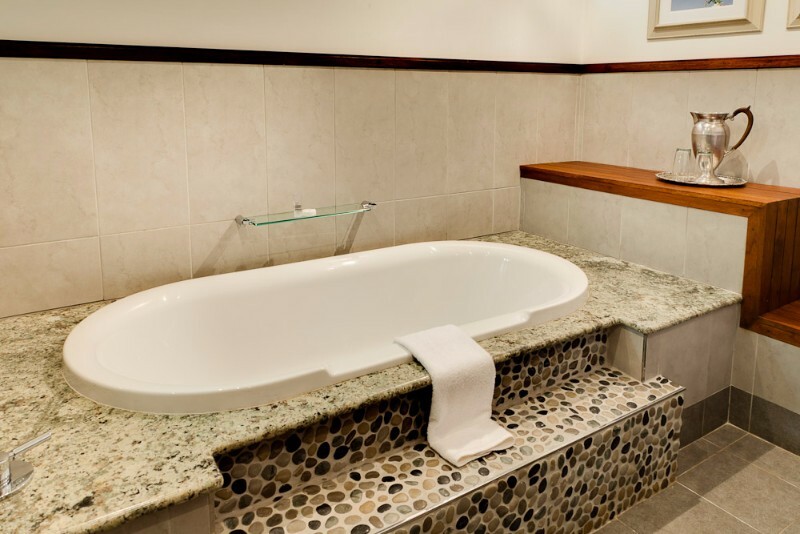 1 Room catering for the physically disabled – includes a large bathroom with a spacious bath with hand rail, roll in shower and physically disabled parking in front of the room. The 46 Deluxe King Rooms are elegantly designed all with a balcony or patio with a breath-taking view overlooking the lake. All the comforts of an old countryside manor but reflecting a unique South African flavour. 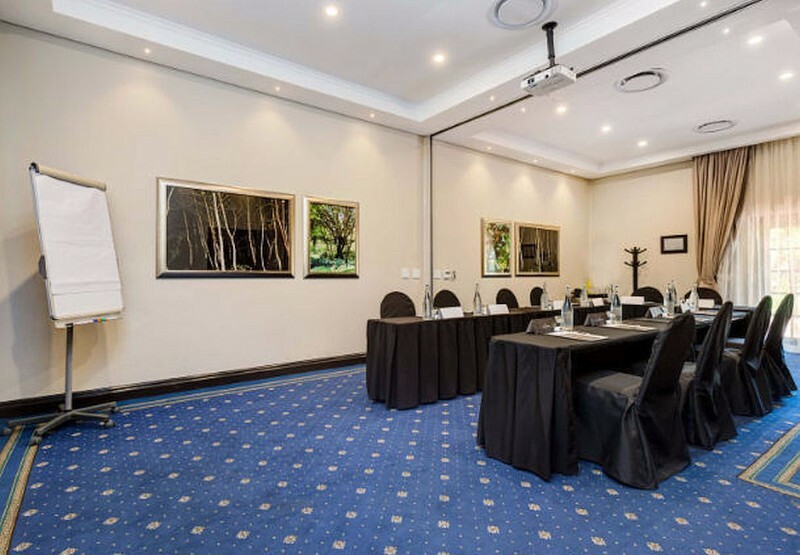 1 Room catering for the physically disabled – includes a large bathroom with a spacious bath with hand rail and physically disabled parking in front of the room. 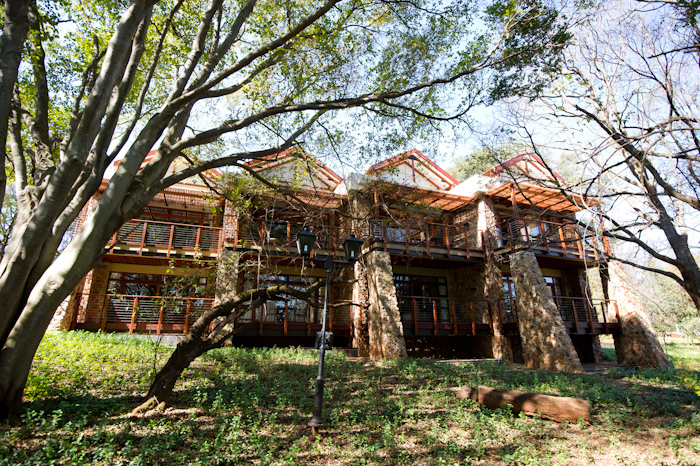 Our 8 SUPERIOR KING ROOMS are hidden away in our amazing natural Camdeboo Forest. 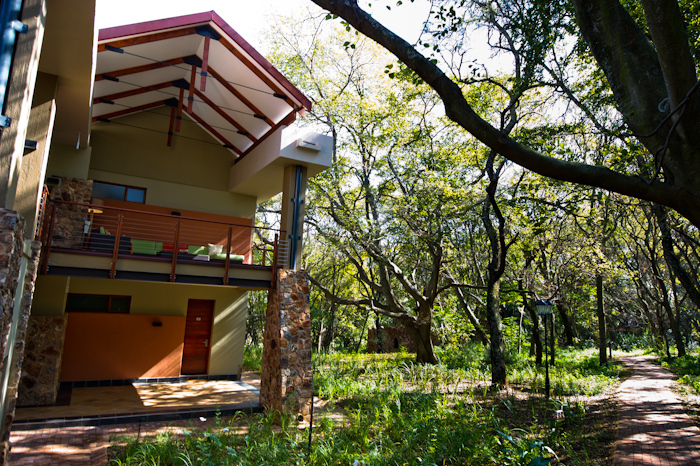 Our 6 SUPERIOR LOFT ROOMS are hidden away in our amazing natural Camdeboo Forest. Each room has high loft ceilings to give that additional sense of space. 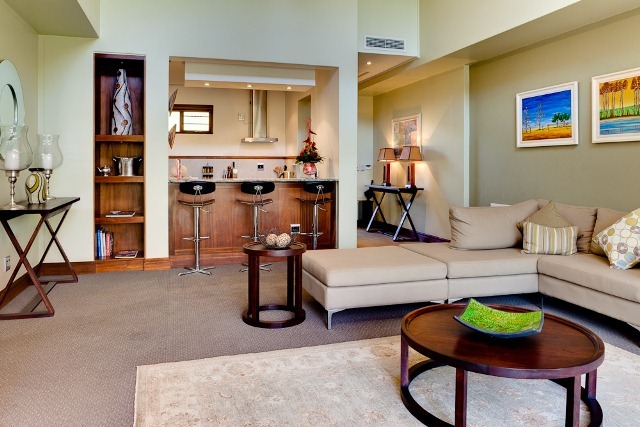 EXECUTIVE SUITES are elegantly designed each with a balcony or patio with a breath-taking view overlooking the lake. 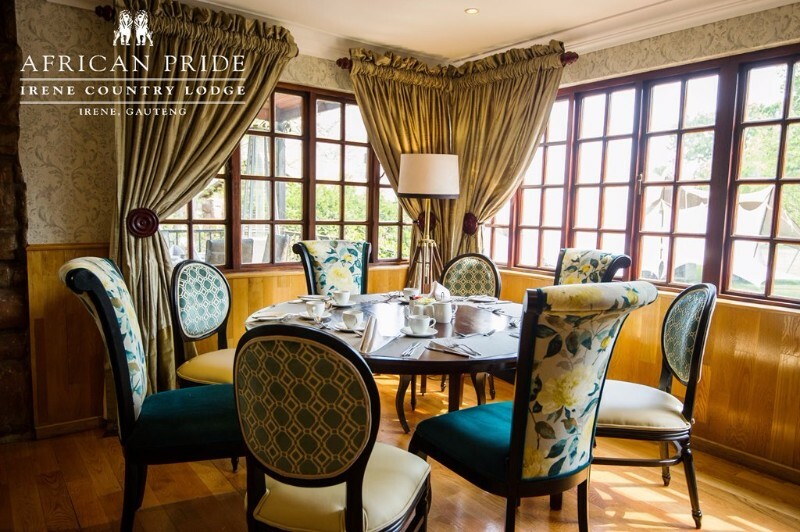 All the comforts of an old countryside manor reflecting a unique South African flavour. PRESIDENTIAL SUITE. This superb 140 m2 suite has an optional Butler on standby 24 hours a day to look after your every need. Hidden away in our amazing natural Camdeboo Forest. 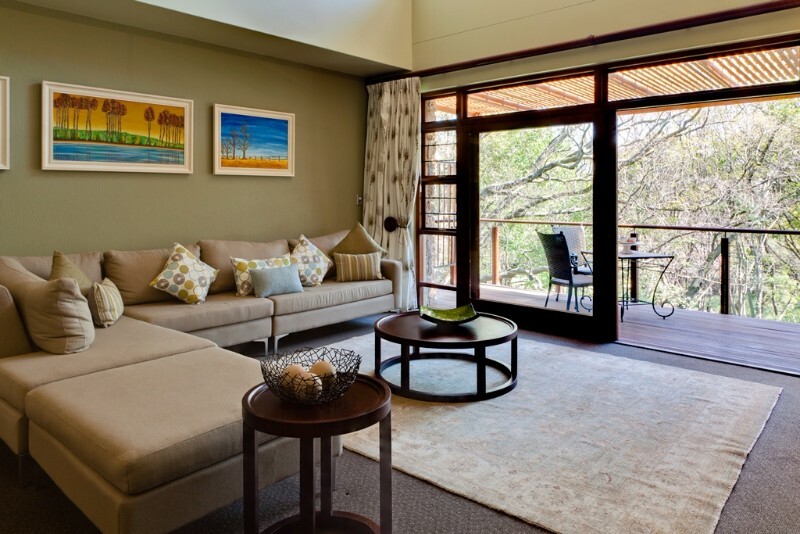 The suite boasts an inside and outside lounge and dining area that can seat up to 8 GUESTS. 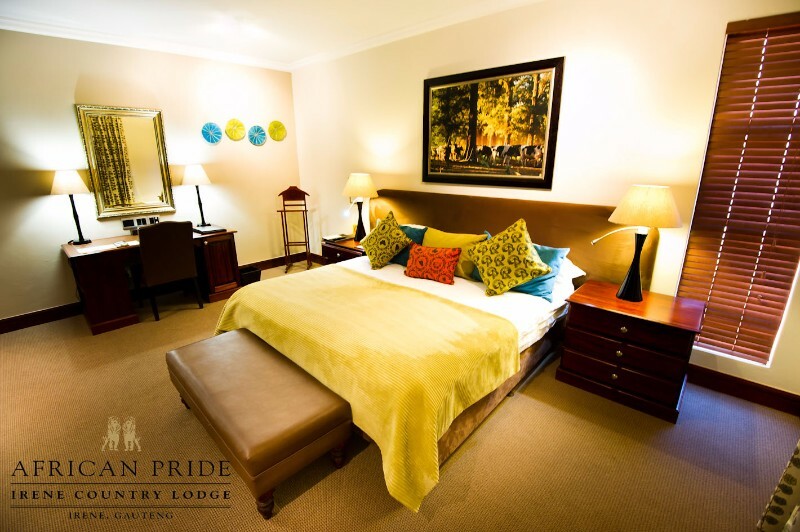 Adjacent to our superior rooms for additional accommodation requirements. High loft ceilings to give that additional sense of space. 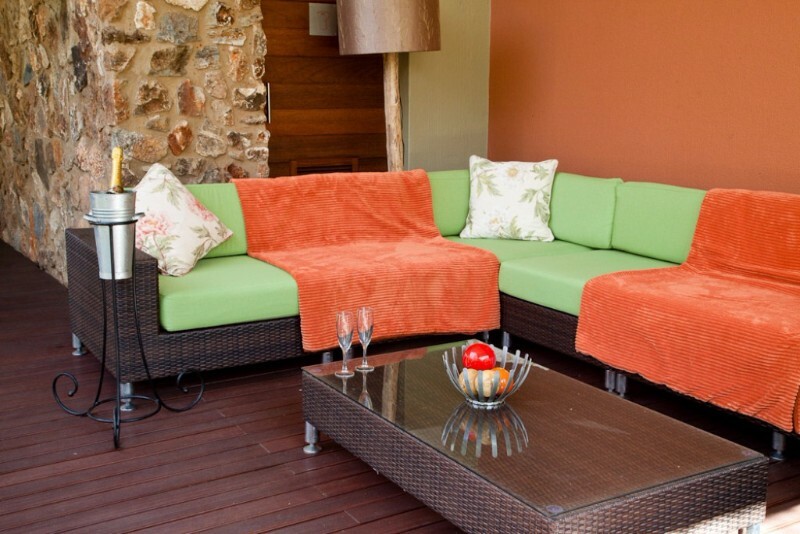 Irene is a suburb of Centurion which is conveniently situated between Midrand and Pretoria. Making the travel to the Union Buildings and surrounding areas a mere 15 min drive away and the travelling to Sandton a 30 min drive, now with the GAUTRAIN these journeys are even more convenient. We unfortunately don't accept any cash on the property, however we do accept all major debit and credit cards are accepted. Kindly note we do not allow for private photoshoots on our beautiful property, should you however have your wedding with us you will be more than welcome to take pictures on your big day. Unfortunately we do not assist with picnics without accommodation.